Brett Lewis and Sean Fredella are among 20 students from across the globe who will present their ideas at the first TED-Ed Weekend in New York on Dec. 3. Journal photo by Emily Williams. When the global idea-sharing non-profit TED created an opportunity for schools to form clubs three years ago, Mountain Brook Junior High teachers Andrew Cotten and Suzan Brandt got to work recruiting students. The clubs were so successful that the organization created an entire youth and education initiative for school clubs called, TED-Ed. Two of the students who started in one of those early clubs, now-Mountain Brook High School freshmen Sean Fredella and Brett Lewis, are among 20 students from across the globe who will present their ideas at the first TED-Ed Weekend in New York on Dec. 3. Neither Fredella nor Lewis ever thought such recognition was within the realm of possibility when they were approached by Cotten, their eighth-grade advanced English teacher, to join the club. “I wasn’t even going to do it, but when I told my mom about it she told me I had to and what a great opportunity it would be,” Fredella said. When the boys figured out what would be asked of them, they were even more skeptical. Each student in the clubs is asked to come up with an idea that changes the way people think about something. The mission is vague because it can encompass just about anything about which a person is passionate. Once Fredella and Lewis chose their ideas, they created presentations and shared those ideas on stage at TED-Ed events hosted by MBJH. Lewis’ presentation, “How Being a Peer Helper Helped Me,” addresses the issue of schools not having enough quality special education programs. While researching for his talk, Lewis found that only 30 percent of schools in the U.S. meet the basic requirements of a special education program. In his opinion, one of the easiest ways for a school to enhance the lives of their special education students is by providing strong peer helper programs. “Peer helping is something that I’ve done since elementary school,” Lewis said. He started in fourth grade, when his only other club option was chess club. 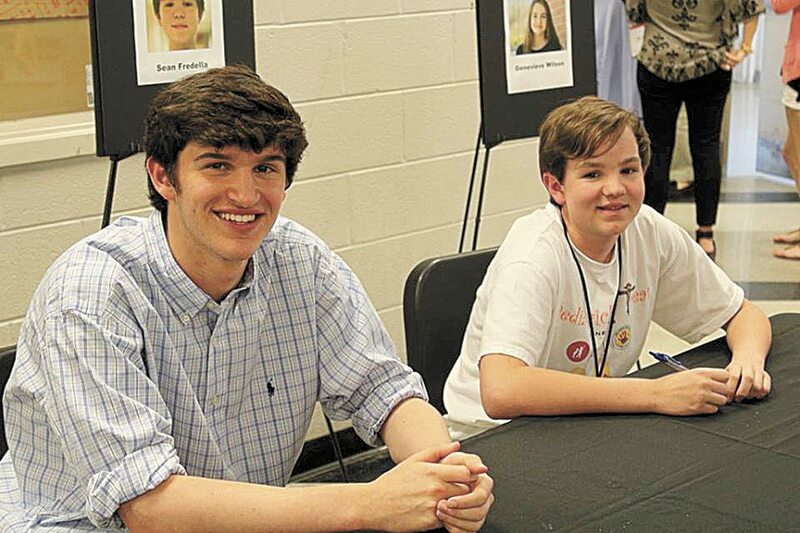 Through Mountain Brook’s peer helping program, Lewis was paired up with a boy he calls “Hugh” in his presentations to protect his friend’s privacy. Lewis and Hugh spent one afternoon a week outside of school working on social skills and school work and going out to places such as the McWane Science Center. Lewis continues to work with Hugh at the high school and describes Hugh as one of his closest friends. The high school gives the boys a period each day to hang out and work together. Lewis said being a peer helper is far more rewarding than it is difficult. It’s all about spending time with someone and learning together, whether that means spending a period working on homework or just hanging out, he said. When Lewis asked him what was so funny, Hugh went completely silent and still. While Hugh has benefited from the program by enhancing his social skills, Lewis said he has learned lessons in being patient, interacting with kids who have special needs and being a kind and caring person. Lewis said peer helping doesn’t require any difficult training, it’s just taking the time to help another student learn something by doing regular, everyday things. “If a school doesn’t have the ability to meet the basic needs of a special ed program, I believe that responsibility is passed on to the students,” Lewis says in his talk. Lewis’ talk calls fellow students to take the initiative in their schools and reach out to a special ed student. While Lewis speaks from the perspective of the helper, Fredella speaks as the beneficiary of his idea. “In my talk, I share my story and then I talk about my problem,” Fredella said. Fredella battled his illnesses for seven and a half years, going through chemotherapy, a bone marrow transplant, radiation and all of their side effects. He fills the introduction of his talk with anecdotes to take the edge off, most notably about taking prescribed steroids, which didn’t provide excess strength so much as excess appetite. “I was the size of a medicine ball and I had the temper of 1,000 Donald Trumps,” he jokes in his video. Beyond his jokes, Fredella notes the friends he made during his treatment and later lost, and how that made him ask why. Fredella discovered that only 4 percent of money spent on cancer research is allocated for pediatric cancers. “We need to provide more funds for pediatric cancer because our kids are worth more than 4 percent,” Fredella said. He found that most people have no idea that pediatric cancers have a color and that color is gold. By persuading athletes from pee wee to professional to wear something gold, Fredella said, the color could become as synonymous with pediatric cancers as pink is with breast cancer. Fredella’s talk calls on members of his audience to promote the color gold in any way they can and to believe in his idea that such a simple action can save the lives of children like himself. “One thing that has been really cool about this, Adidas saw the talk and now they are working on having their athletes wear gold during the month of September,” Fredella said. During the first weekend of December, Fredella, Lewis and Brandt will make their way to TED Headquarters in New York City, where they’ll rehearse before the event and participate in a few surprises that TED has been keeping a secret.